Unlock additional business features of this free Plugin with Product Importer Deluxe. The latest release of Product Importer can be downloaded from WordPress Plugins (plugins.wordpress.org) or here on this page. Looking for support, a copy of the readme, Plugin updates, Ideas or usage instructions? 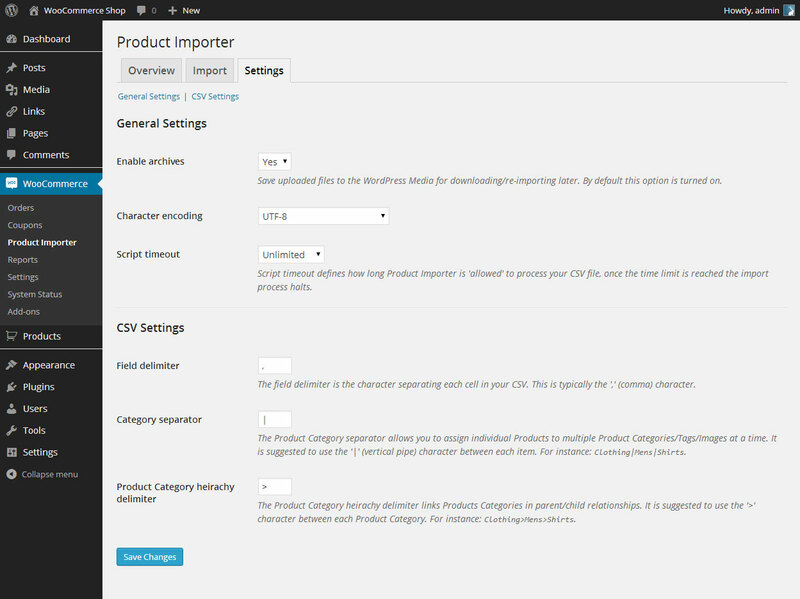 Check out our Documentation for Product Importer. Hola, estoy buscando un plugin que importe imágenes de los productos a mi tienda. En mi csv no se incluyen los nombres de las imágenes o las url de donde se encuentran. Y quisiera saber si su producto puede enlazar las imágenes desde ftp o galería de WordPress mediante el SKU. El nombre de la imagen es el mismo que el sku. Es decir, hacer que coincidan mediante ese nombre. 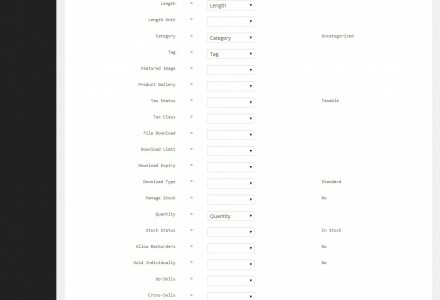 I have exported the woocommerce orders but do not know how to import them . There is a plugin that does this ? Hi Christian, right now we don’t offer a solution for importing Orders into WooCommerce. We will announce a new Plugin to achieve this in the near future. In the interim please Google for a CSV or XML WooCommerce Order import Plugin as there are solutions that currently do exist. Im having trouble importing multiple catagories with this. My products belong to multiple different catagories, the tags work fine but cannot seam to get it to work with the catagories. Hi Rich, open up a topic on the Product Importer Forums and we can look at this together. Please include version details as well as a sample of your import file so I can reproduce this with you. hi does this product update the current products with the values of the file ? Hi Jean-Philippe, yes you can merge your file changes against existing Products. We are looking for a tool that will allow us to import Subscriptions from the woocommerce store. We are having a hard time importing them manually. 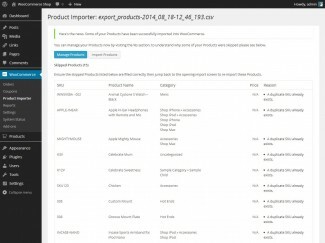 I know your pro export tool will export subscriptions, but will this tool allow the import of them? I don’t see any mention of it. Thanks! Hi Angel, importing Subscriptions is likely the hardest use case for any import solution as it requires that an Order, Subscription and User is linked correctly or generated at import time. We are exploring how we can support importing different export types but for now are limited to Products only and will announce new import types on our Blog, I recommend doing a database clone in the interim for migrating Subscriptions between WooCommerce stores. I need to import\export category tree (only categories without products). I had successfully EXPORTed caterories list with your https://wordpress.org/plugins/woocommerce-exporter/ plugin, but I can’t find any possibility to IMPORT them back by this plugin. can it be done? and what is the correct way? 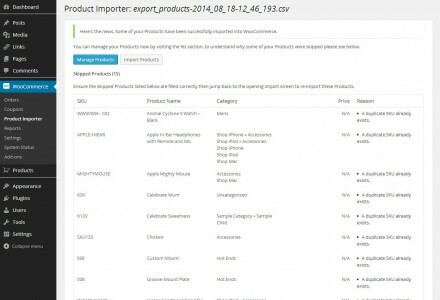 I am trying to use this to import/export from two wooCommerce sites but when I upload the csv file i got from your export tool from the other site it goes through 1127 items and then deletes them and says “an existing Product could not be found”, why would I want to import a product on the site if it already existed?!? Is this plugin not intended for this use? Yes, I see that and did that as only new products but it turned all my variations into product pages and now my 47 products are 1,130 products, a rather unwieldy mess. Is there a way to import it again as variation sets? My question is why your one tool is called Shop Exporter and then the one to upload is only called Product Importer and not Shop Importer. I looked at your list for importing and neither the Free or Pro versions say anything about attributes or variations. They are an integral part of WooCommerce stores and the main reason I do not want to have to manually copy all this over or type it out again, being more then 1000+ list items. Hi jayman, until WooCommerce came along there was no demand for importing anything other than Products. This is all new turf for WordPress and WooCommerce. We are working on a replacement for PID which will support more than just Products but it will take time and draws resources away from Premium Support and regular Plugin updates which is why it has been delayed. Hi jayman, you’ll need to run the import again with the delete import mode to clear out those erroneous Profucts. I’ll follow up via Premium Support on how to import Variations and Attributes. Ok, I moved them all to trash manually, now I see how useful the delete feature is. If you sent anything to my email in the last two days please resend as my work server was down and emails lost. Look forward to resolving this, thanks. Are you going to contact me or do I make a support ticket? Support is just for Premium plugins, we are talking about a free one here. If it is able to work with attributes and variations I think it would be good for everyone to know on a how-to page so we are not wasting your time with support tickets. 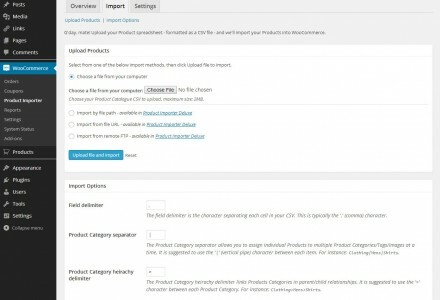 It will be interesting to see how you add limited variations as at least in wooCommerce you can only add variations AFTER you have made attributes. Hi, My client wants to be able to bulk import coupons and is using the iThemes Exchange plugin. Do you offer a solution to import coupons with this store? That’s great news. Do you have any idea how soon into the new year it will support iThemes Exchange? Hi, do you have an update on when this will work with iThemes Exchange to bulk import coupons? Hi BaseMediaUK, import got put on the burner this quarter as interest has been 99% export. The general mood this month I’ve received is swinging back to import so starting next week I’ll be committing resources to SID (that means Coupon support) for Exchange and other Platforms. 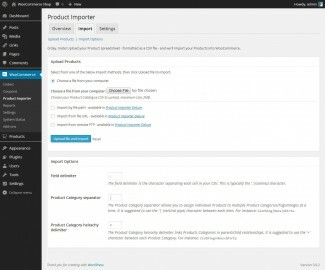 Look for a solution to export and import products from a woocommerce store to another site. Like your premium plugin so, i tested with the free versions of your plugins but apparently does not work well because of the special Portuguese characters (ç, é, è, ã, etc.). Is there any way to properly encode the product? You warrant that the Product Importer Deluxe solves this problem? The Product Importer Deluxe copy custom fields? I read in a previous review that you offer the Deluxe Exporter plugin store to purchase Product Importer Deluxe confirm? The Product Importer Deluxe works well with products variations? What about images? The plugin copies the images? I am trying to get in touch regarding hiring you to help with a plugin I need for Exchange. Please contact me at info (at) dmlwebservices (dot) com. Thanks. Hi dmlws, sure thing, we can’t e-mail out from our support/sales e-mail address but send me an e-mail at sales@visser.com.au and we can discuss this further. 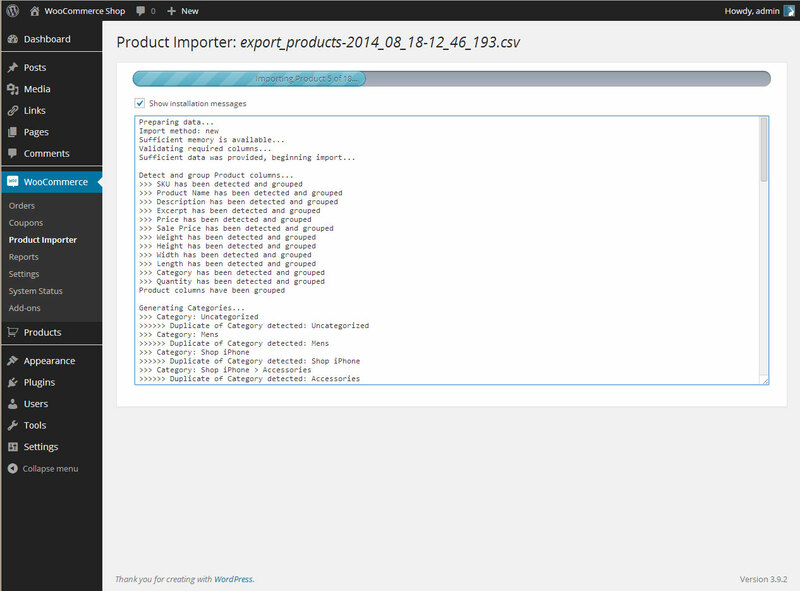 Product Importer comes with a Quick Start document (readme.txt) to help with installing the Plugin. Additional support can be found from the Contact page or methods below. 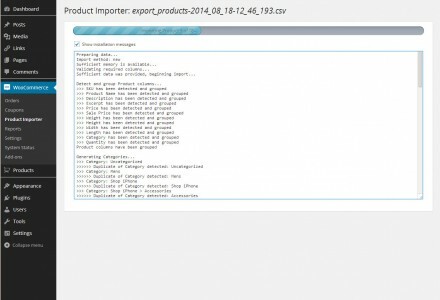 Check out our Documentation for Product Importer. If you have any problems, questions or suggestions please join the members discussion on our Product Importer forum. 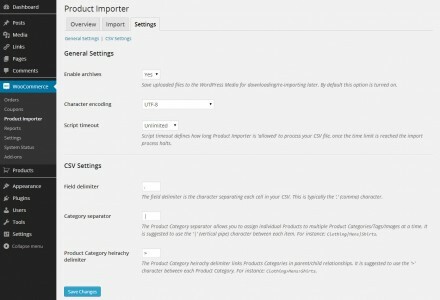 Import new Products into your WooCommerce store into simple formatted files (e.g. CSV, TXT, etc.). Import new Products into your iThemes Exchange store from simple formatted files (e.g. CSV, TXT, etc.). Additional import features will be introduced in regular major Plugin updates, minor Plugin updates will address import issues and compatibility with new iThemes Exchange releases. If you have any problems, questions or suggestions please raise a support topic on our dedicated iThemes Exchange support forum.